GRAIN traders along with farmers are looking forward to the resumption of wheat exports after a gap of four years as India heads for record production of the grain. 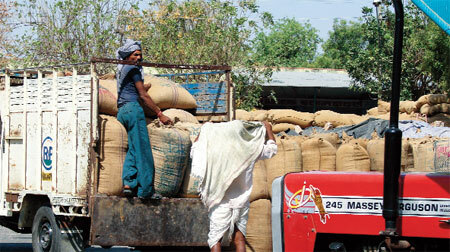 India, the biggest wheat producer after China, had banned the crop’s export in 2007 to ensure food security. In the last week of March, minister of state for agriculture Arun Yadav hinted that the government may lift the ban on wheat exports and a decision is expected by April-end or May. 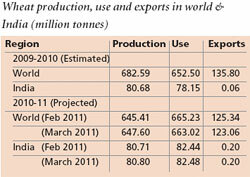 The government estimates a yield of 84.27 million tonnes in 2011. At present, India’s wheat stocks are 17.2 million tonnes, more than double the government target of 8.2 million tonnes. There is a question mark, however, on the quantity that would be allowed for export. D P Singh, president of the All India Grain Exporters Association, believes the amount would be two to three million tonnes. India will most probably export to West Asia and Africa, adds Singh. Sources in the agriculture ministry say the Centre is yet to formulate a policy on whether the private sector or public enterprises or both would be allowed to export wheat. However, they add, the export would be limited. An officer from the State Trading Corporation of India Limited says, “Once the decision on export comes, a notification would be issued by the Directorate General of Foreign Trade, outlining the procedure to be followed for export.” Wheat crop can be broadly classified as milling and feed wheat. Traders are also banking on a recent presentation by the Commission for Agriculture and Cost Prices to the government. The presentation states, “India is storing foodgrain worth approximately Rs 40,000 crore” and the government’s spending on storing a kilogramme of wheat is Rs 16. But according to M S Sidhu, senior economist with Punjab Agricultural University, the lift on ban would not serve any purpose. 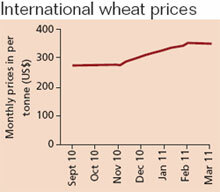 Last month, international prices for a bushel (1 bushel = 27 kg) of wheat was US $8. When calculated at the rate of Rs 45 per USD, the price is Rs 13.33 per kg. The minimum support price (MSP) offered is Rs 1,120 per quintal (that is Rs 11.20 per kg). So the two rupee hike in international price could be attributed to transportation and freight charges. Food Corporation of India is presently wheat in Madhya Pradesh and Gujarat at Rs 1,220 to Rs 1,300 and Rs 1,150 to Rs 1,382 per quintal, respectively.